CustomHire.com is another Internet service application based on our proprietry Backhauling.com web software. Although most of our applications relate to food and fiber production, the customhire.com component will function quite well for a host of day to day service related activities. 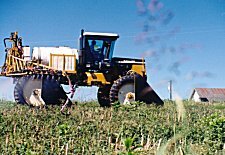 The application will allow the scheduling of spraying in the agricultural field, crane work in construction, and landscaping in housing, etc. We suggest you list in the vendor directory as a company and then do on line scheduling with the Customhire.com component. We have purposely created the data entry free form to include as many fields as needed. At some future date we will hard code the fields that are being utilized. Your input is welcome in refining this application to be useful to you. Please contact us with your suggestions.